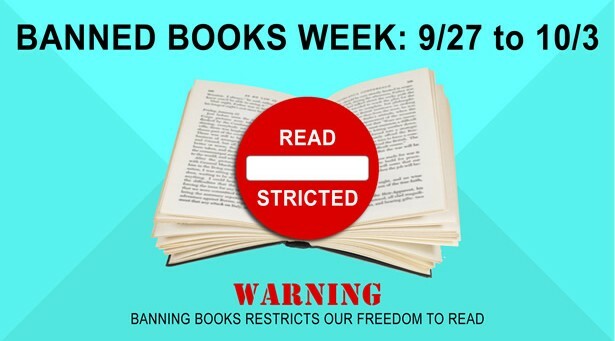 Banned Books Week 2015 (September 27 to October 3) is highlighting books written for teens. Teen literature because it realistically confronts serious issues dominates the most challenged lists of literature. Area Teen Librarians are participating in Banned Books by displays and programs. At the Oak Park Public Library Rachael Bild is having teen volunteers research why a teen book is challenged, wrapping the book in brown paper, writing the reason on the cover and promoting “Blind Date with a Banned Book”. Rachael has found that talking about the freedom to read with the teen volunteers has been an invigorating process. Trixie Dantis at the Arlington Heights Library is doing the Banned Book Blind Date but as a program. Books will be wrapped and numbered with the genre and reason they were banned on the outside. Teens will get 30 seconds to “speed date” the book before passing it on to the next person. The teens will write down the numbers and in the end check out the books. Teens can’t unwrap the books unless they’re checking it out. At Zion-Benton Public Library Dawn Abron is hosting a Don’t Read John Green Party. The teens will celebrate Banned Books Week with An Abundance of Quotes (Make Quote Art), Looking for Bufritos (Eat Fried Burritos), The Fault in Our Vinyls (Make a Phone Skin out of Vinyl) and Paper Kahoots (Play John Green Kahoot trivia). Teens will enter the Vlogteen Confessional to win John Green prizes. Four John Green titles are on the Most Challenged Banned Books List. Niles Library teens are celebrating their freedom to read by visiting the Banned Book Display in the Teen Underground. A discarded work of literature has been shredded and the teen are guessing what title is the shredded book from a ballot list of 15 top teen challenged titles. First of all teens are amazed that the library shredded a book. After carefully explaining that the book was water damaged and had to be discarded, the teens begin to read why each teen book has been challenged. This leads to discussion about certain books and an informal book discussion begins. The books also seem to disappear quickly from the display. What is most evident is that these titles have been read and show the effects of multiple check-outs. Boys in library programs have always been the holy grail of YA librarianship but, that doesn’t mean the ladies have to be left out. The Plainfield (IL) Public Library started a teen book discussion this summer. The Alex Rider Series was chosen because of it’s popularity and fast pace and appeal to boys. When the book club finally took place the club was split between boys and girls. My own stereotypes led me think that a series about a teenage spy appealed only to boys. I was pleasantly surprised that we had girls at our discussion and I thought it would change the dynamic of the group and create different conversations. Again, my stereotypes were dead wrong. The girls were talking about how cool the explosions were or how tense a fight scene was as much if not more than the boys. Some of the success of the program was that it was billed as a “Teen Book Club” and didn’t have a gender associations. Also signing up for the discussion in conjunction with our summer reading program helped. We will finish what is published of the Alex Rider series in the second week in September and will move on to the Percy Jackson series.